The "work from home" trend is definitely on the rise because it's often more cost-effective. (The tax benefits of having a home office aren't bad either!) 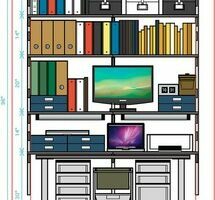 Here's how to turn any space in your home into a home office -- from basic closets and storage spaces to garages and attics. What could have possessed a builder to construct this over-sized garage that is attached to the front facade of such an attractive house? What’s your best guess? I have my own ideas.